Husain Limdiyawala October 12, 2017 October 12, 2017 Astronomy, Did you know? Our planet earth has about 510.1 million square kilometres in surface area. We are part of the solar system with sun in the centre. Our sun is whopping 109 times in diameter then the earth. Our solar system is roughly 122 AU in diameter where each AU (Astronomical Unit) correspond to 150 million kilometres! We are part of milky way galaxy somewhere towards the orion arm approximately bit towards middle. 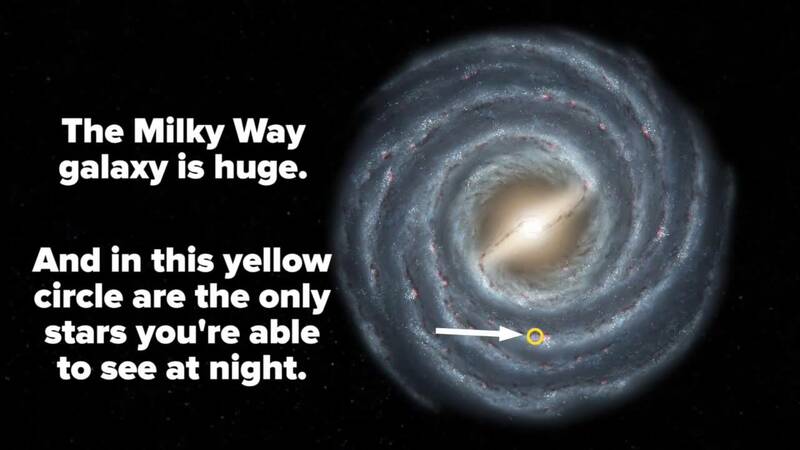 Our milky way is 100,000 light years in diameter and has close to 400 billion stars. That may sound astronomical, but milky way is a dwarf galaxy compared to other galaxies which span millions of light years in diameter e.g. hercules A galaxy is 1.5 million light years in diameter. Now lets talk about universe. Well, we have not been able to even remotely measure the approximate size. What we have been able to piece together so far is the observable universe from our planet earth. We have so far observed about 46.5 billion light years which would be radius from earth. The diameter there by shall be 83 billion light years!! There are approximately 100 billion galaxies in our universe. Just to give it a perspective, the light from sun reaches earth in 8 minutes and 20 seconds and sun is 150,000,000 kilometres away from earth. Its ludicrous to see nations fighting with each other in order to capture few hundred kilometres of land on earth and establish their supremacy. Their nation is equivalent to a tiny microscopic cell not to a human body, not to a country, not to the earth but a tiny microscopic cell compared to our solar system. That itself is pretty much unobservable using any possibly devised tools. We don’t know in totality the size of our universe and i reckon we would never know as its expanding at a very high pace. There will be a time in future when we will look in the sky but we will never see any stars as we would have drifted apart in lonely pocket of the universe. By the way, the earth is travelling around the sun at a speed of 108,000 km/hr and the entire solar system is moving in galaxy at the speed of 828,000 km/ hr. Also, according the researchers there can be billions of universes and we happen to be just in 1 rightly configured one. Previous Humans vs virus, World war 3?